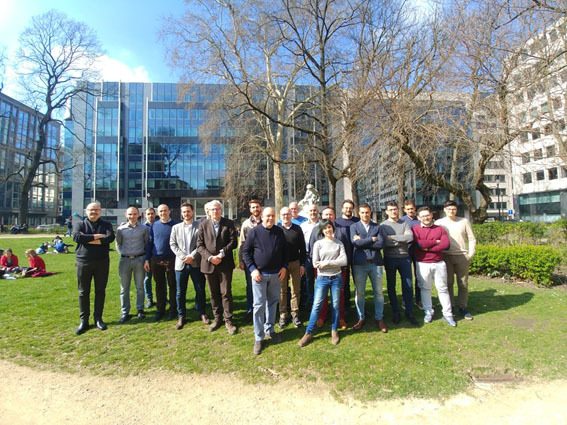 On the occasion of the 18 months since the beginning of ReFreeDrive project, its partners met on 20th and 21st March at Brussels for a new General Assembly, just the day after GV04 Dissemination Event. During the meeting, which coincides with the midterm of the project length, the tasks carried out by the partners during the last six months were reviewed, and the status of the different Work Packages was analyzed in order to define actions for the second half of the project, when the 8 e-Drives (200kW and 75kW) will be manufactured and tested. Advances in electric motor technologies (Induction Machine, Permanent Magnet Assisted Synchronous Reluctance and Pure Synchronous Reluctance): conceptual features; electromagnetic, mechanical and thermal studies for different design approaches and available technologies; and definition of the best downscaling strategy for the 75kW e-Drives. Market analysis and technological watch, focusing on the following topics: electric vehicles (EVs) & motors market evolution and forecast for both European and global markets, customers’ needs analysis and technological evolution of the rare earth dependency on the EVs field. First draft of business and exploitation plans, including definition of IPR guidelines. New content suitable for dissemination purposes and new events proposals where ReFreeDrive project could attend in the next months. Finally, let me remind you that at this time the first major reporting period has taken place, which means that you will have access to new downloadable content shortly!.